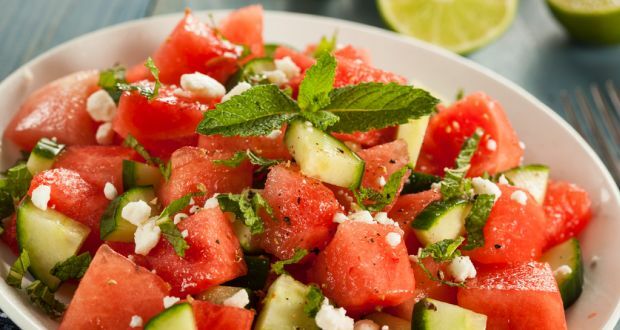 Mediterranean Watermelon Salad Recipe: A quick serving of a refreshing salad with hydrating ingredients. Watermelon cubes, cucumber, tomatoes, lettuce and bell peppers drizzled with a light dressing. 1.Pour pomegranate juice into a bowl. 2.Add mustard paste, oregano, jeera powder, salt & pepper and whisk it well. Then add olive oil. 3.In another bowl, put the watermelon cubes, yellow bell peppers, onions, cucumber, tomatoes and olives. 4.Add parsley, salt and pepper. Mix them all well. Add lettuce leaves, flax seeds and pistachios. Add to the watermelon mixture. Toss it well.